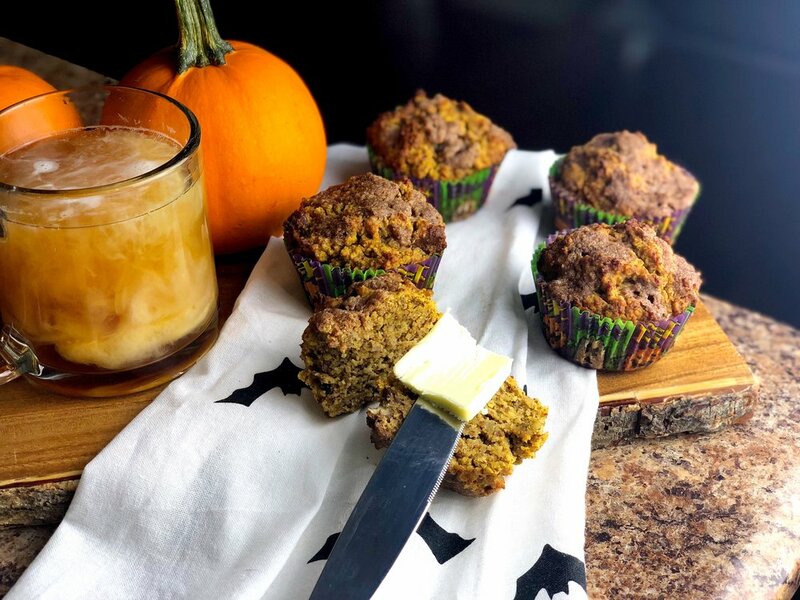 Another pumpkin ðŸŽƒ recipe for all my fall/pumpkin lovers!! These muffins are incredibly filling and delicious! They definitely help be not feel left out when I see everyone and their mother eating muffins and sipping their PSLs! The muffins are cool proof and can be whipped up in under 10 mins(plus bake time) so even the busiest of us can enjoy! This morning I heated mine up for 15 sec in the microwave and put some butter on itðŸ¤—Delicious!! My pumpkin cheesecake bars are done cooking and I will share that recipe tomorrow! Who loves pumpkin as much as I do?! 2. Combine pumpkin, eggs, and vanilla in a blender. Blend about 30 seconds. 3. Add the almond flour, sweetener, baking powder, cinnamon, pumpkin pie spice, and salt. Blend again until smooth. If your batter is overly thick, add 1/4 cup of water to thin it out. 4. By hand, stir in pecans. 5. Blend the topping ingredients together in a food processor or blender. Then sprinkle the topping equally over the muffins. 6. Divide the mixture among the prepared muffin cups and bake 30 to 35 minutes, until just golden brown and firm to the touch. 7. Remove and let cool completely. I like to top with a dollop of freshly whipped cream if you have the macros.